Several years into an unprecedented apartment development cycle, the most expensive line of product is facing rigid competition. In some big-construction markets, rent growth has flattened in Class A product, as operators of existing luxury units rein in their pricing strategies in an effort to keep occupancy from tumbling. But that’s not the case everywhere. Some markets are continuing to log significant price increases in Class A units. In the U.S. overall, Class A rent growth of 2.4% was right in line with the 2.5% bump recorded for all asset classes in the year-ending June. This increase in that pricey product line is down from the 10-year average and well below the peak of 6.2% seen at the end of 2011, just before the construction pace took off at full tilt. 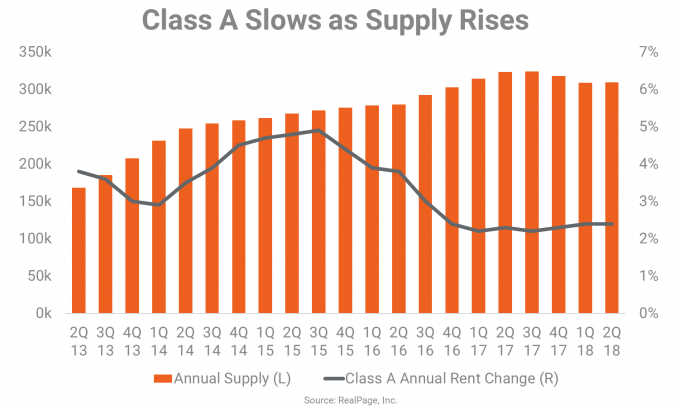 In comparison, rent growth in the nation’s Class B stock is running right in line with its decade norm, while operators in Class C product are still raising rents well above the long-term average for that product segment. While overall increases have cooled in a competitive marketplace, Class A rent growth continues at a notable pace in some metro areas. Among the nation’s 50 largest apartment markets, most metros are still logging rent growth of 2% or more in the Class A product lines. Out of the top 10 largest increases – of about 4% or better – most were in Florida or California markets. Class A rent growth was most pronounced in Orlando and San Jose, where prices in that luxury stock grew 7.2% in the year-ending June. Orlando was also the nation’s top overall rent growth market in 2nd quarter and has stood out as one of the country’s best performers during the current economic cycle. Overall, rents in Orlando’s Class A segment have grown nearly 60% since 2009. San Jose’s Class A stock is some of the most expensive in the country, and rents are still growing notably. The 7.2% annual increase is down from the double-digit hikes this product line saw in 2011 and again in 2015. But it remains ahead of the long-term norm. In comparison, San Jose’s other product lines saw increases between about 3% and 4% during the past year. 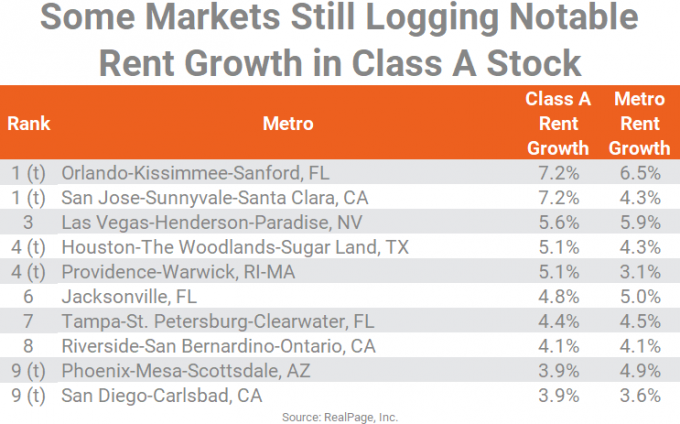 Las Vegas logged annual rent growth of 5.6% in the Class A stock, while increases were at 5.1% in Houston and Providence, and 4.8% in Jacksonville. In Las Vegas, where suburban submarkets, not the urban core, command the highest rates, rent growth in Class A units was strong, but not quite as solid as what was seen over the past four years, and not as hearty as the increases in the Class B product line. Houston’s apartment market is benefiting from a now-thriving economy and a steep drop-off in construction volumes in recent months. Operators in Class A product across the metro are taking advantage, raising rents 5.1%. 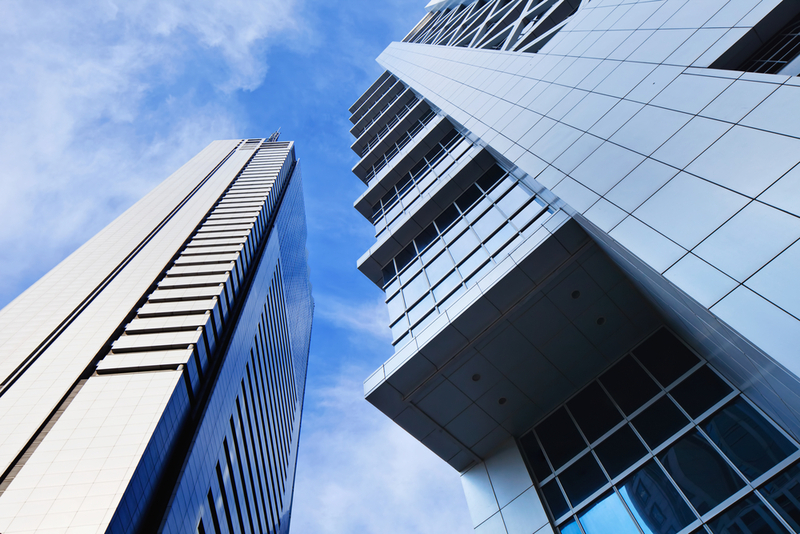 This recent upturn is especially significant, given the round of rent cuts this niche suffered throughout much of 2016 and 2017, when the economy was struggling to pick back up after the most recent oil price downturn. In both Providence and Jacksonville, rent growth of around 5% in the Class A stock was well ahead of the 10-year average. While this was the best performance among product niches in Providence, Jacksonville’s most expensive units recorded price increases a bit below Class B and C stocks. Annual rent growth in Class A apartments was clustered between 3.9% and 4.4% in Tampa, Riverside, Phoenix and San Diego. In each of these metros, annual increases were down from recent peaks near the 8% mark. Some metros have flattened or even cut Class A rents, especially in urban core submarkets, in reaction to a deluge of deliveries in recent years. Four metros – Seattle, Chicago, Nashville and Portland – were slashing rents in Class A units as of 2nd quarter, while minimum growth was seen in the pricey product lines in key metros like Dallas, Boston, Newark and Atlanta. For more information on the latest results from RealPage, check out the Summer Apartment Market Update webcast on demand.